Condition is New. Ha s Bu rj A l Ar ab l og o on reverse of b ox. Un op en ed, br an d ne w.
EAU DE TOILETTE EN VAPORISATEUR. 50 ML NEUF SANS BOITE. HERMES TWILLY EAU DE PARFUM 50ML. 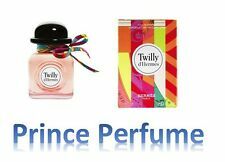 TWILLY EAU DE PARFUM 50ML. Sisley Black Rose Precious Face Oil 25 mlEUR 136,95. Sisley Black Rose Cream Mask 60 mlEUR 101,95. Sisley Deeply Purifying Mask 60 mlEUR 89,95. Ihre Vorteile. USt-IdNr. : ESP B35813914. Palmas, Toma 1710, Folio 103. A BOTTLE OF HERMES "UN JARDIN EN MEDITERRANEE " PRE OWNED USED ONCE. HAS SOME SCRATCHES ON BOTTLE AND NO BOX .100% GENUINE. PLEASE SEE PICTURES AS THEY ARE PART OF THE DESCRIPTIVE THANK YOU. New Hermes Twilly d’Hermes Eau de Parfum Spray 12.5ml. Condition is New. Dispatched with Royal Mail 2nd Class. Sisley CelluliNov 200 mlEUR 136,95. Sisley Black Rose Skin Infusion Cream 50 mlEUR 133,95. Sisley Black Rose Precious Face Oil 25 mlEUR 136,95. Sisley Black Rose Cream Mask 60 mlEUR 101,95. Sisley Deeply Purifying Mask 60 mlEUR 89,95. Le jardin De Monsieur Li. EAU DE TOILETTE FOR WOMAN. IT SENDS AS YOU SEE IN THE IMAGE. VAPORISATEUR SPRAY. ESPAÑA :El transporte de este artículo se realizará por agencia de transporte urgente. GASTOS DE ENVIO. INTERNATIONAL SALES. Artículo nuevo y original, nunca usado. KELLY CALECHE. EAU DE PARFUM FOR WOMAN. IT SENDS AS YOU SEE IN THE IMAGE. EAU TOILETTE FOR WOMAN. IT SENDS AS YOU SEE IN THE IMAGE. KELLY CALECHE. EAU DE TOILETTE FOR WOMAN. IT SENDS AS YOU SEE IN THE IMAGE. EAU DE NARCISSE BLEU. EAU DE COLOGNE UNISEX. IT SENDS AS YOU SEE IN THE IMAGE. EAU D'ORANGE VERTE. EAU DE COLOGNE. IT SENDS AS YOU SEE IN THE IMAGE. EAU DE TOILETTE PARA MUJER. VAPORISATEUR SPRAY. INTERNATIONAL SALES. EAU PARFUM. IT SENDS AS YOU SEE IN THE IMAGE. EAU TOILETTE. IT SENDS AS YOU SEE IN THE IMAGE. BATCH CODE 1K1F2. vaporizador spray. Eau de toilette 100 ml. CALECHE EAU DELICATE. EAU TOILETTE FOR WOMAN. EAU PARFUM FOR WOMAN. IT SENDS AS YOU SEE IN THE IMAGE. GENTIANE BLANCHE. EAU DE COLOGNE. IT SENDS AS YOU SEE IN THE IMAGE. 24 FAUBOURG. EDITION LIMITEE CARRE DE SOIE. Todos los productos que vendemos son originales. ORIGINAL PRODUCTS. All products are original. Si adquieres varios artículos con diferentes gastos de envío señalados, se abonará siempre sólo el superior. Brin de Réglisse. Eau de Toilette. Eau de toilette. Very RARE - Collectable - Con caja y cellofan. Fragancia original con su caja, sin celofán - NO TESTER. EAU DE PARFUM FOR WOMAN. IT SENDS AS YOU SEE IN THE IMAGE. Aun asi acepto la devolucion del producto. Hiris: from the flower to the fragrance, the modern and refined mindset of a unique unifloral, all devoted to the splendor of the iris. A perfume of emotion and subtlety conceived by Olivia de Giacobetti, it expresses its charm with an infinite delicacy; sometimes floral, sometimes powdery or plant-like, always one of the olfactory wonders of nature. Hiris was launched in 1999. The nose behind this fragrance is Olivia Giacobetti. New and sealed item, I have more Discontinued fragrances, Be sure to see my other items, thanks. EAU DELICATE. EAU TOILETTE. 30 ML / 1.0 FL. EAU DE MANDARINE AMBREE. EAU DE COLOGNE UNISEX. IT SENDS AS YOU SEE IN THE IMAGE. 24 FAUBOURG HERMES eau Parfum 100m. 24 FAUBOURG. EAU DE PARFUM PARA MUJER. We want your order to arrive to you safely and in the best condition. INTERNATIONAL SALES. BATCH CODE 1H1J. EAU TOILETTE. 100 ML / 3.3 FL. ROUGE HERMES EAU DELICATE 50ml spray, sealed. New and sealed item, 100% original, I have more discontinued fragrances , Bee sure to see my other items, thanks. Eau de toilette (old formula). Very RARE - Collectable - Con caja y cellofan. Fragancia original con su caja y celofán - NO TESTER. Very RARE - Collectable - Con caja y cellofan. Fragancia original con su caja y celofán - NO TESTER.